Here’s another Italian staple, Risotto. Although it may sound intimidating, it’s actually quite easy. The beauty of risotto is that it is not as commonly done and it seems like it is difficult, so the dish is that much more impressive when cooking for guests. Also, you can make it your own by putting in pretty much whatever your heart desires. 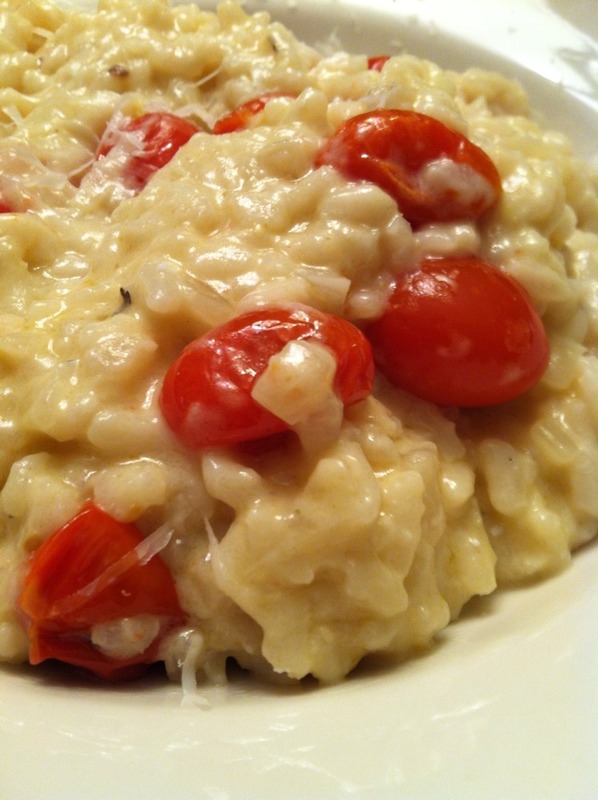 So, here is the basic risotto recipe and then I’ll give you ideas for what to add (and when to add it), including my go-to roasted grape tomatoes, and how it can be served. Add chicken stock to a small pot and heat to a low simmer. On a different burner, heat a large pot on low heat with some olive oil and a tbsp of butter. Keep simmering until risotto is complete. Mince onion/celery and add to the large pot. Season. Once onions/celery have cooked down a bit, add crushed/minced garlic. After 1-2 min, add the arborio rice, crank up heat to medium-high and stir frequently until arborio rice is toasted some, showing little brown spots on the rice. Add the wine/vermouth and continue to cook until absorbed. You’ll know when the liquid is absorbed when you scrape the bottom of the pot and the rice no longer fills in the space you just cleared. Now, add in the simmering chicken stock, one ladle at a time, and turn down the heat to low. Allow the stock to absorb between each ladle-full and stir occasionally. Crack some black pepper in if you’d like at some point. If you have any veggies that need to cook, add them roughly about halfway through this process (when you’ve used up about half the chicken stock). When the rice is creamy and al dente, with the most recent ladle of stock absorbed, you are just about done. If you run out of stock and the arborio isn’t quit finished, you can use some hot water for the last few ladles. Turn off the heat, add in a few handfuls of parmesan, lemon zest and if you’d like, a little bit of butter, and stir. Add in your roasted tomatoes (or other precooked veggie/meat) and GENTLY incorporate. Cover your pot for 1-2 minutes to let it all come together and melt, and then SERVE! Other options of what can go in this: mushrooms, asparagus, shrimp, scallop, truffles, sea bass, brocollini. Experiment! Roast the above ingredients in a small dish at about 375-400*, making sure skins don’t char too much and tossing on occasion for even cooking. Once a few tomatoes pop, turn heat down in oven all the way so that they are just keep warm. You don’t want the tomatoes to be too mushy or else they’ll break apart when incorporating with the risotto, and won’t give you that pop of flavor in the dish. Also, make sure to not add to much of he juices into the risotto as it may be unable to absorb more liquid at this point and you’ll end up with soupy risotto. If you want this roasted tomato flavor cooked into the rice, then add some of this juice during the liquid absorption stage.